eBook: How to Grow your Savings? Though Indians continue to be under invested in the stock market there is more interest coming in from all corners. 200,000 new demat accounts are opened every month. Recent transparency measures should also bring more people in. The stock market will no longer be treated as a gamble but will be put on par with real estate and gold. 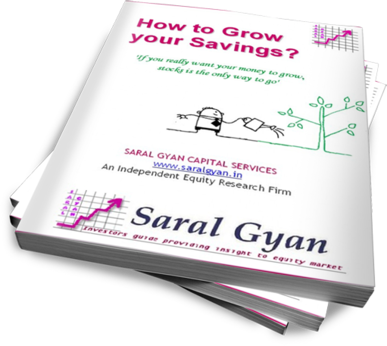 Saral Gyan's 88 pages e-book is priced at Rs. 599 ($ 11.99) only. Wait! You can grab it for free by subscribing to our annual subscription services under Saral Gyan Diwali Dhamaka Offer of the Year. Click here for details. In case of any queries, do not hesitate to contact us.